This turned out to be one of the toughest training weeks I've ever had. It certainly was the longest closing in at a whopping 146.5km with today's long run being my longest training run too. For most parts I felt pretty good all week though a little tired at times. This was particularly evident on Wednesday when I ran the third in the series of the Yateley 10k races. I was hoping to run my fastest time of the three races in the series but it wasn't to be. It was windier than the previous two races and I found I just didn't have the bounce in my legs I'd hope and I certainly didn't have the juice to pick up my pace in the second half like I normally do. I think the lack of energy in the second half may be down to me pushing the first half trying to power through the heavy legs and get through halfway in 18:15. I hit half way in 18:20 and managed to pick up my pace for a a bit but I couldn't hold it and didn't have the energy to attempt to out-sprint anyone in the final stretch, hence I didn't dip under 37min. 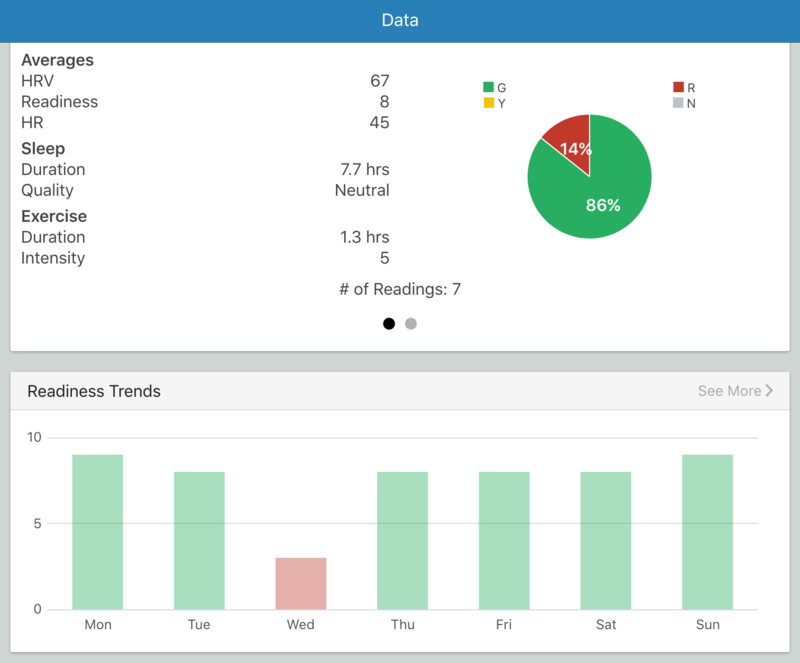 I suspect I may have been edging on the brink of functional over-training last week which ended with Wednesday being the day my HRV actually showed this. The training towards the end of last week was fantastic and I felt quick and fluid, which can sometimes be an indication of over-training or too much stress. It also makes sense given how big a week last week was. That all said, I'm quite chuffed with keeping all three races pretty consistent. They all had finish times that only spanned 30 secs: 36:37, 36:31 and 37:01. 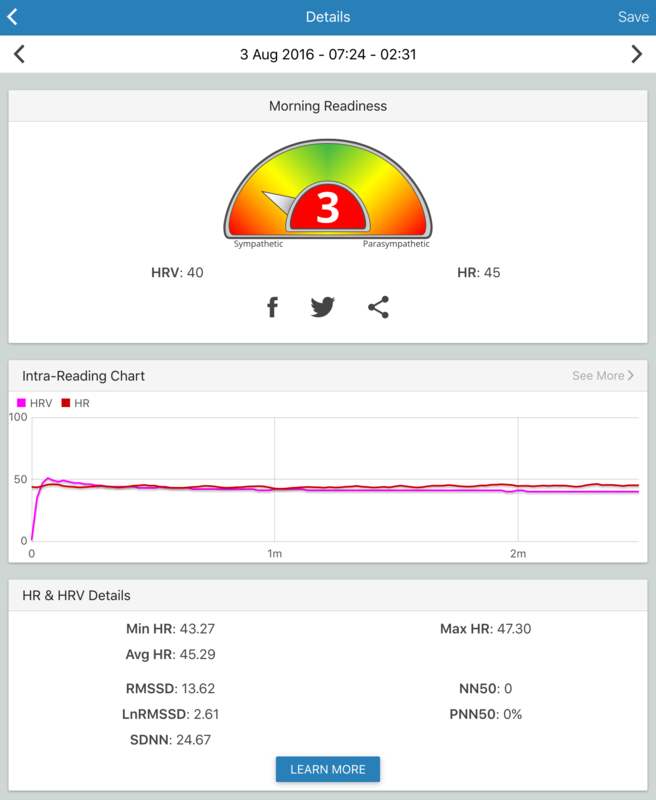 Despite Wednesday's worse than desired performance, I kept up with my training using my morning readiness HRV readings as a guide, and as you can see above, they were all good. I headed down to TVP yesterday morning for the Reading parkrun. I woke up normal time, saw the sun was shining, checked my HRV which showed all was good and decided I'd head down, but not push myself too hard. I good run and only had two goals in mind: enjoy the run and run about 18mins. I started off a little quick but soon settled down and finished in 17:59 and really enjoyed the run too. Goals accomplished 🎉. This morning I got up extra early as I knew today's 39km run - my longest ever training run - would take longer than the usual three hours I allocate on a Sunday morning. I try to get back from my long runs by 10am. This ensures I do most of the run in the cooler part of the day and it means I don't take up too much our Sunday. I had my "Titanium Tea", it's like Bulletproof coffee, but uses tea - I'm experimenting with pu erh for flavour and Yerba mate for the caffeine kick - and then hit the road. I decided to follow the River Kennet to Aldermaston and then come back along the Bath road before rejoining the Kennet in Reading town centre. The run out was very pleasant, but the run back along the Bath road was a bit dreary - I'll definitely avoid the Bath road if I can in future. In the end a tough challenging run, but very enjoyable. Experimented with my homemade "gel" again (at just over two hours) and this definitely helped in the latter third of the run. The only thing I need to do is better plan where I'm going to get water as I was quite thirsty in the last hour of the run. As I said above, today's long run closed off my biggest week ever. Next week it's a severe cut back in mileage as it's a recovery week and I'm racing on Sunday and plan on using this to gauge how I've progressed since the Fleet half marathon earlier this year.